Canada’s two Olympic teams will get their final tuneup for Sochi at the 2014 WFG Continental Cup in Las Vegas, it was announced today. Brad Jacobs’ team from Sault Ste. 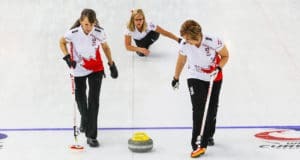 Marie, Ont., and Jennifer Jones’s team from Winnipeg, who won the men’s and women’s titles at the Tim Hortons Roar of the Rings, presented by Monsanto, earlier this month in Winnipeg, will headline Team North America at curling’s version of the Ryder Cup when it makes its first foray outside of Canada. The event is scheduled for Jan. 16 to 19 at the Orleans Hotel and Casino in Las Vegas. 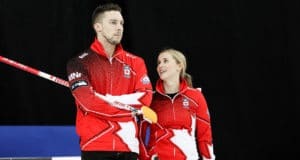 They’ll be joined by two other Canadian teams: Winnipeg’s Jeff Stoughton, who qualified by winning the Capital One Canada Cup in December 2012 in Moose Jaw, Sask., and Ottawa’s Rachel Homan, the reigning Scotties Tournament of Hearts champion. Team North America will be rounded out by John Shuster of Duluth, Minn., and Erika Brown of Oakville, Ont./Madison, Wisc., who earned their trips to Vegas by prevailing at the United States Olympic Curling Trials in November in Fargo, N.D., and will go on to compete in the Sochi Olympics as Team USA. 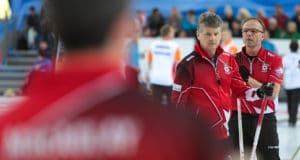 Shuster clinched his berth this past weekend at the World Curling Federation’s Olympic Qualification Event in Füssen, Germany. 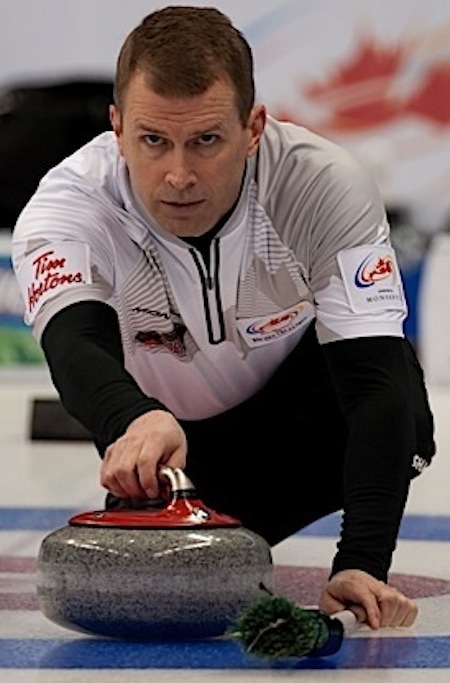 Winnipeg’s Jeff Stoughton will be part of Team North America in Las Vegas. It’ll be the first WFG Continental Cup appearance for Team Jacobs, which made history by becoming the first team to go unbeaten through the Canadian Curling Trials. Rick Lang of Thunder Bay, Ont., will be the Team North America Coach for the fourth straight WFG Continental Cup, while Steve Brown (Erika’s father) will be the Team North America Captain. Team North America will be looking to defend the title it won in the 2013 renewal of the Continental Cup in Penticton, B.C., and become the first side to repeat as champion this unique event that pits six North American teams (four from Canada, two from the U.S.) against a six-team World lineup in a variety of curling competitions. It will be the 10th renewal of the event. They’ll be pitted against a Team World side, helmed by Captain David Hay of Scotland and Coach Peja Lindholm of Sweden, that features five teams that will compete at the Sochi Olympics: reigning men’s and women’s world champions Niklas Edin of Sweden and Eve Muirhead of Scotland, along with David Murdoch of Scotland, Thomas Ulsrud of Norway and Margaretha Sigfridsson of Sweden. Satsuki Fujisawa of Japan will round out the Team World lineup. The WFG Continental Cup, a joint venture of the Canadian Curling Association, World Curling Federation and USA Curling, features six teams from North America competing against six teams representing the rest of the world in various disciplines during four days of competition — traditional team games, mixed doubles, singles, mixed skins and standard skins games. Each segment awards points for wins (or ties). A total of 60 points are available, meaning the side that earns more than 30 points will be declared the champion. Ottawa’s Rachel Homan will participate in her first WFG Continental Cup. For the six mixed Doubles and six singles matches, one point will be awarded for each victory, one-half point if tied). There will be 18 team games (nine men’s and nine women’s) played, each worth one point for a win and a half-point for a tie. All games are eight ends and there are no extra ends. There will also be six skins games, with each game worth a total of five points to the winner. The winning side receives $52,000 Cdn ($2,000 per member, including captain and coach), while the losing side gets $26,000 ($1,000 per member, including captain and coach). As well, the side which generates the highest points total from the six Skins games will receive an additional $13,000 ($500 per player, plus captain and coach).